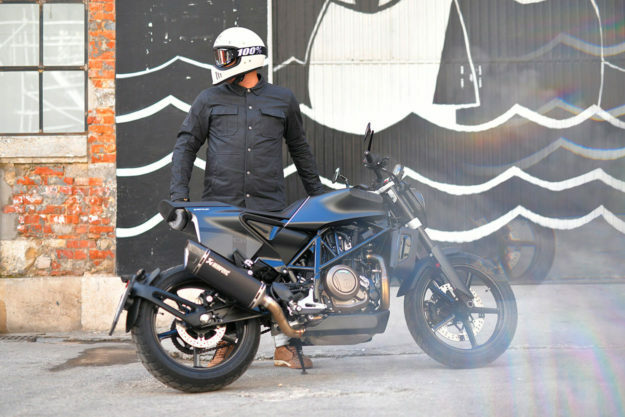 Of all the Husqvarna street bikes, none has been so hotly anticipated as the Svartpilen 701. Especially by riders who love the forward design and ride dynamics of its Vitpilen café racer sibling, but can’t get along with its ergonomics. 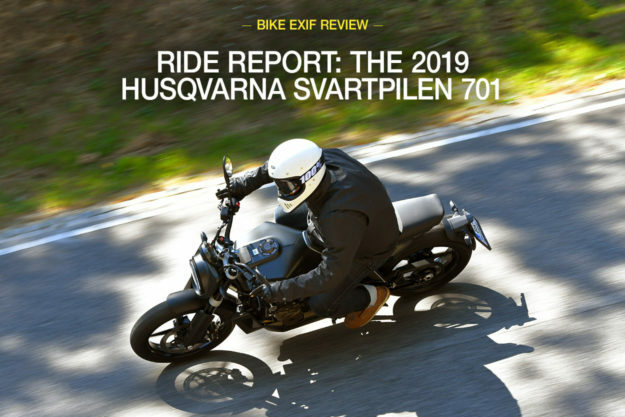 Excitement hit fever pitch when Husqvarna announced (at EICMA last year) that the Svartpilen 701 was indeed going into production. And like its 401 stablemates, the factory bike is as close to the original jaw-dropping concept as you can get. But what’s it like in the flesh? Does that neo-retro flat track style translate into a decent street bike? Do pastéis de nata custard tarts taste better in Portugal than anywhere else? I traveled to Lisbon to find out the answers to these burning questions. In simple terms, the Svartpilen 701 is a different riff on the Vitpilen 701 that we reviewed last year: trading café racer style for a hit of flat track flavor. The design is more neo-retro than it is throwback; futuristic even, with a clear nod to Husqvarna’s Scandinavian roots. All the body panels are plastic—and that’s OK because they’re also light. The build quality’s right up there too, and everything feels carefully considered and well finished. The number board and headlight combo, fork guards and tail section are all clear flat track cues. And the combination of the single rear number board and exhaust, both on the right, echoes the asymmetrical design typical of race bikes. 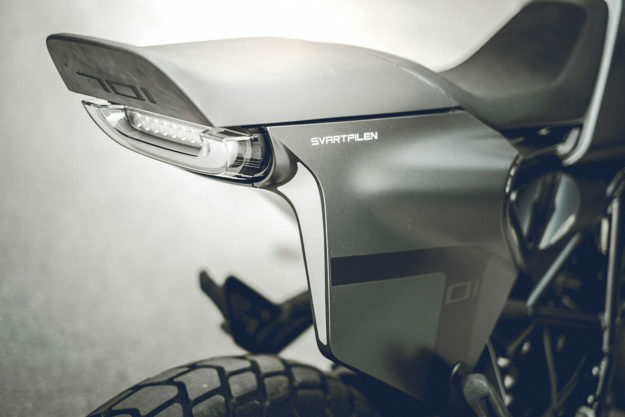 The Svartpilen 701 is also stacked with neat details. Check out that silver line that runs down from the seat and tank junction, and how it lines up perfectly with the exhaust hangar. 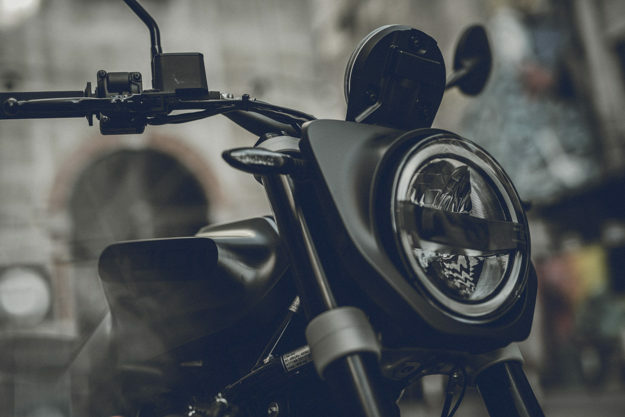 The head and taillights are both LED items, and there’s a ring-shaped daytime running light that’s becoming a signature of the Husky street range. Bronze finishing on the tank cap and engine covers breaks the all-black scheme, and the branding is super-subtle. The saddle is covered in synthetic fabrics, but the combo of a suede-like upper and perforated sides looks high-end. And that duck-tailed section is actually a piece of high-density foam, making it a sneaky (albeit hardly practical) pillion seat. 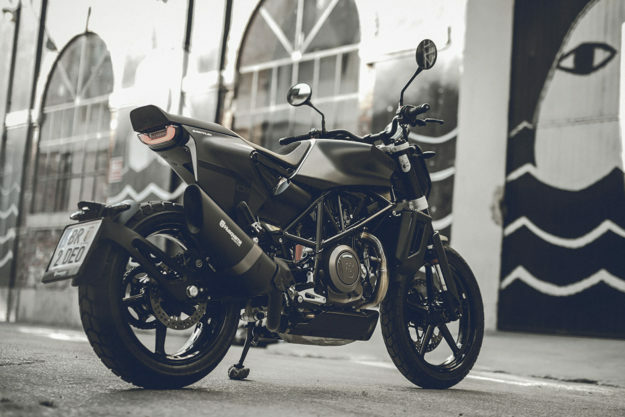 If black isn’t your thing, Husqvarna will be building 500 Svartpilen 701 ‘Style’ units too (below)—but only for the European market. They trade the black paint for an all-bronze finish, with spoked wheels and a handful of tasty catalog parts. 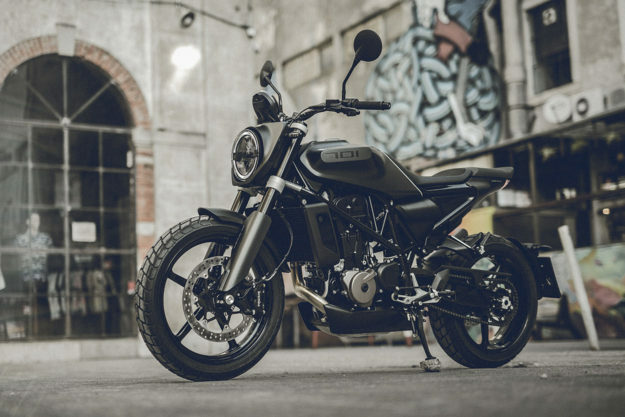 Underneath the Svartpilen 701’s swanky exterior, you’ll find a chromoly frame and a 693 cc single-cylinder motor, both borrowed from the KTM 690 Duke. And that’s a good thing: the liquid-cooled, 4-valve single is a total gem with dual counter-balancers to suppress vibration. It’s good for 75 hp and 72 Nm, and the overall package weighs under 160 kg. 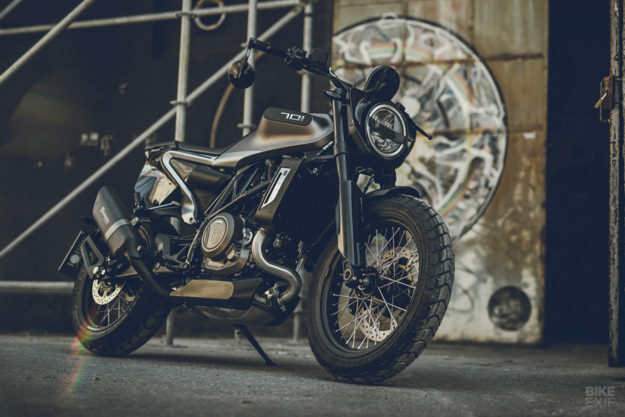 That gives it a horsepower-to-weight ratio only a tiny fraction less than the figures Indian are quoting for the FTR1200, that other hotly-anticipated roadster influenced by flat track design. Power is handled by a ride-by-wire throttle, a six-speed box and a slipper clutch. Switchable traction control is standard issue, along with Bosch ABS and Husqvarna’s ‘Easy Shift’ clutch-less shifter. The Svartpilen 701 is refreshingly well-kitted throughout. The 43 mm upside-down forks and the rear shock are from WP Suspension, and both are adjustable for compression and rebound. 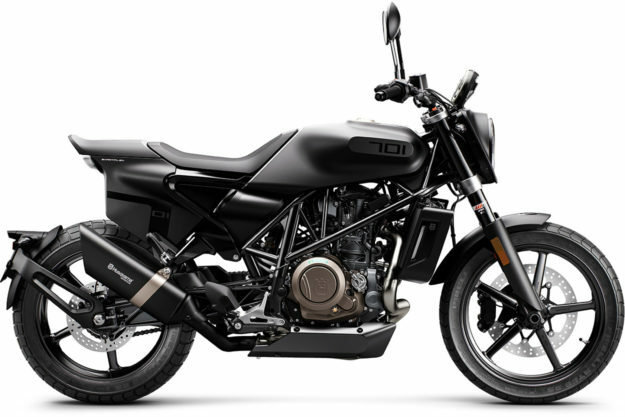 There’s 150 mm of travel at both ends—15 mm more than the Vitpilen 701. Both ‘Pilens use five-spoke alloy wheels, but the Svartpilen gets a size bump to an 18” up front (with a 17” out back). Brembo brakes and Pirelli MT60 RS tires round out the package. Up in the cockpit, you’ll find wide, upright bars to counter the Vitpilen’s clip-ons. The speedo’s been pitched up to match the riding position, the switchgear is standard fare, and the clutch and brake levers are adjustable. 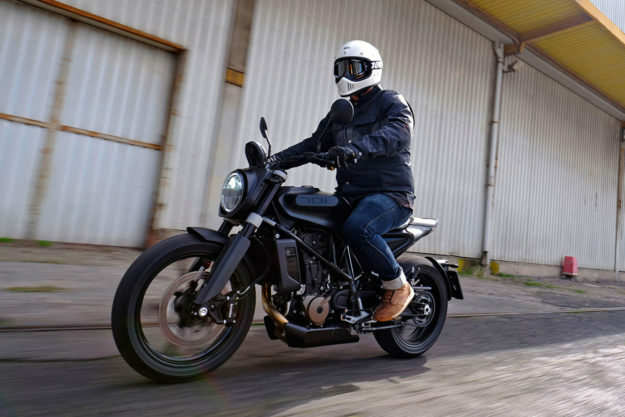 With more suspension travel and a bigger front wheel, the Svartpilen has a touch more ground clearance and a higher seat (835 mm) than the Vitpilen. Add to that the higher bars, and it makes for a far more commanding riding position. Which, Husqvarna tell us, was exactly the point. 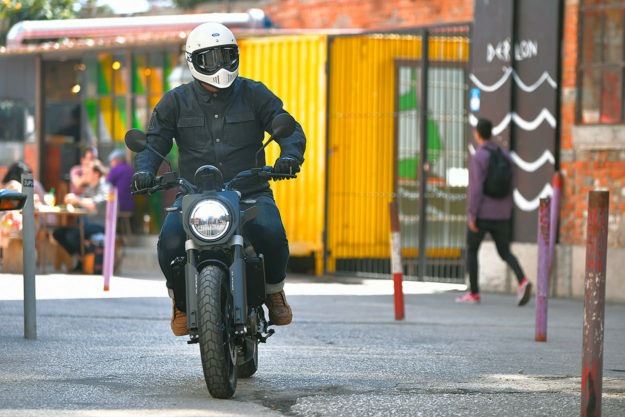 They designed the Svartpilen 701 with ergonomics that’d make it ideal for urban exploration—and better for everyday use. 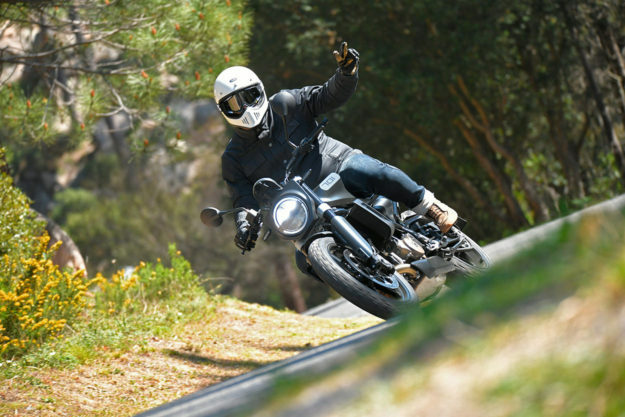 And to prove just how much of an all-rounder the bike is, our hosts plotted a route that would take us through Lisbon’s grid-locked streets, along the Atlantic coast and up into some twisty mountain roads. 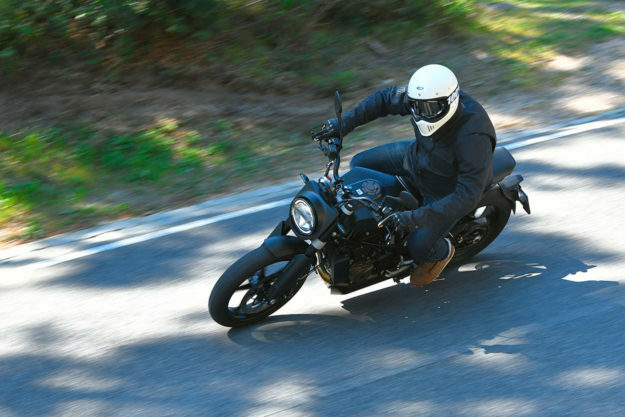 Within seconds I knew I’d have a tough time being objective about the Svartpilen 701. That’s because Husqvarna have pretty much built my ideal motorcycle. Even for my six-foot frame, the Husky’s ergonomics feel flawless; a solid mix of comfort and control. With its low weight and oodles of low-down torque, the 701 springs off the line. The ride-by-wire system gets the power down without any hiccups or burps, making the throttle crisp and responsive. 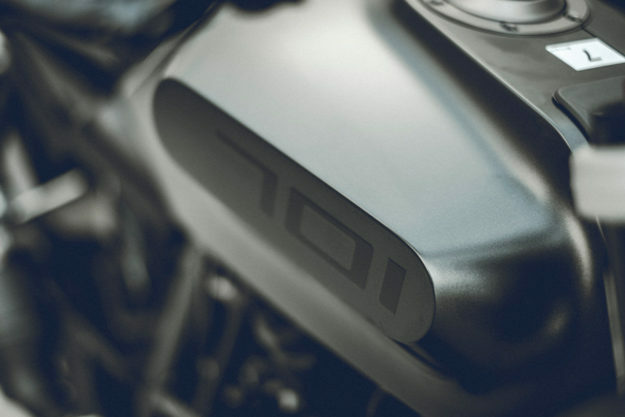 The traction control does its thing without ever feeling too invasive, but turn it off, and the 701’s immediately more wily—in a good way. I couldn’t wheelie if my life depended on it, but some of my fellow riders spent plenty of time with the front wheel in the air. 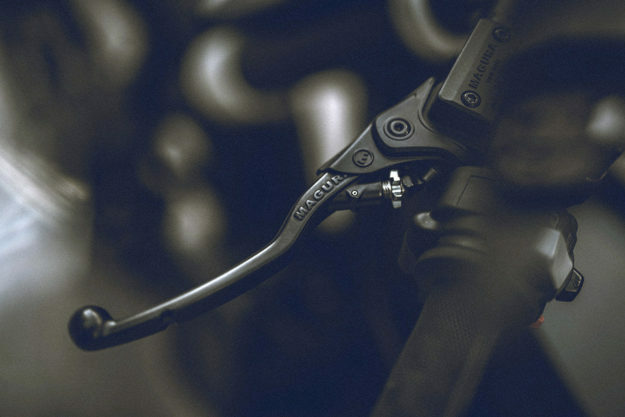 The Husky’s Easy Shift setup gives you a quick shifter on upshifts, and an auto-blipper down. It works a treat and adds an extra dose of fun, but it’s not completely flawless—I found a couple of false neutrals between fifth and sixth. Our ride saw us battling traffic in town and attacking corners in the hills. Again, the Svartpilen 701’s low weight and confident ergos helped it shine in both situations. The surefooted chassis is happy to tip toe through tight spaces, and then flick through turns in anger. Even with their dirt track aesthetics, those Pirelli MT60 RS tires don’t sacrifice much grip on asphalt. I pushed them surprisingly hard into turns and they stuck, giving me plenty of warning if they were close to breaking away. The Brembo stoppers performed really well too; sharp, but with plenty of feel. 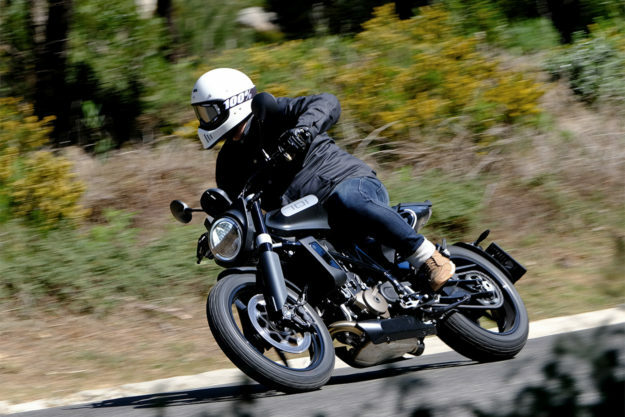 It makes the Svartpilen 701 the perfect recipe for hooligan antics: low weight, agile handling and snappy acceleration. But it’s not without its limitations. Even though it holds decent speed on the highway and runs smoother than you’d expect a thumper to, there is still some vibration through the seat and bars. And although the seat’s surprisingly cushy for its thickness, it starts to falter after about 150 km. So while the 12-liter fuel tank gives decent mileage, I wouldn’t pick the 701 for long days in the saddle. I’m also not a fan of the Svartpilen’s round dial. I love the display itself, which packs a lot of info into a well-arranged design, but the unit is much bigger than the actual display area. (There’s apparently a lot of circuitry packed in there.) And the speedo buttons are near impossible to operate with gloves on. I’m not sure that it’s a deal breaker, but it sure is something that needs improving—because the rest of the motorcycle works so damn well. Husqvarna is pitching the idea of a simple machine that makes you fall in love with motorcycling again—and they’ve nailed it. 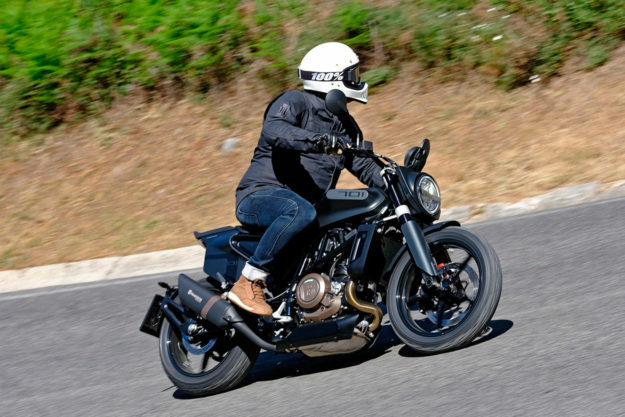 The Svartpilen 701 is a no-frills whip that does exactly what it says on the tin: hoon around while looking really fly. If there’s a catch, it’s the price. 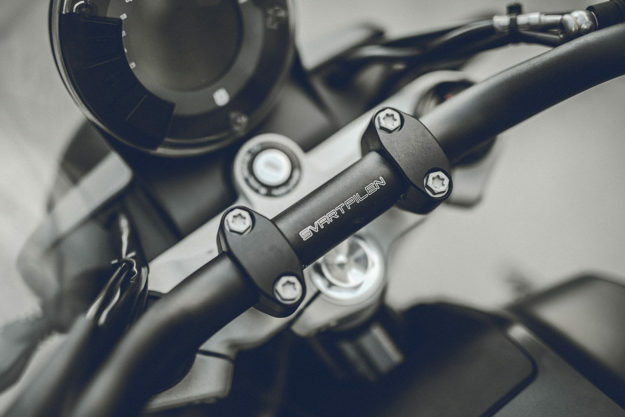 At $11,999 in the US, the Svartpilen 701 is in the same territory as established performers like the Ducati Monster 821 and Triumph Street Triple R.
Which means it ain’t cheap. But it sure is good—and well worth a test ride, if you’re looking to add a sporty and stylish middleweight to your garage. Images: KISKA GmbH, Schedl R., Romero S., Campelli M.